Forensics is a rapidly expanding field that offers a variety of professional career options. A Bachelor of Science degree in forensic chemistry affords students the flexibility needed to launch an exciting and secure career in federal, state, or local labs associated with crime labs and medical examiner’s offices. Other job opportunities for forensic chemists lie in industrial and environmental positions or other fields of forensic science, academia, and administration. A professional forensic chemist is someone who runs tests on evidence found at a crime scene, which is essential for solving crimes. This evidence may include cloth fibers, hair, fingernails, paint chips, glass fragments, blood stains, or other bodily fluids. Characterization of evidence requires extensive knowledge in chemistry, biology, and genetics. 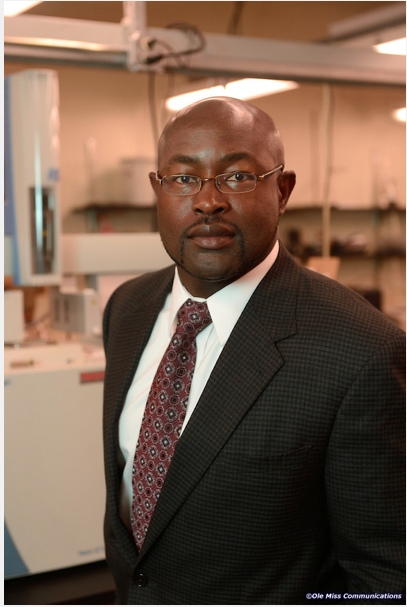 As the director of forensic chemistry, I oversee the direction of the Forensic Chemistry Program. My administrative duties include revising the program’s curriculum as needed, recruiting and retaining the brightest young minds, developing students’ research skills through the use of high-tech analytical techniques from optical methods (ultra violet/visible, infrared, X-ray) and separation analyses (gas chromatography, HPLC, and thin-layer chromatography), and providing majors with academic and career advising. A master’s degree in forensic chemistry is being planned. Wilstermann, A. M.; Bender, R. P.; Godfrey, M.; Choi, S.; Anklin, C.; Berkowitz, D. B.; Osheroff, N.; Graves, D. E., “Topoisomerase II-drug interaction domains: Identification of substituents on etoposide that interact with the enzyme,” Biochemistry 2007, 46, 8217-8225. Godfrey M.; Graves. D.E. “Design, Synthesis, and Characterization of a Novel Ethidium-DNA Adduct.” February 2004. (invited 2004 submission to Chemical Research in Toxicology).